With hearts forever broken, the family of Robert James Hull (Rob, Boomer) wants to announce that he is resting peacefully in the arms of our Lord. Rob was called home to heaven Wednesday, January 30th shortly after 11am, not more than 24 hours after he was removed from life support. Rob suffered from a severe brain bleed caused by his many heart and diabetes complications in the past 6 years. His family surrounded him as he gave us the most loving gift of all; a chance to spend his last days assuring him of our love and support as he made his way to God. He was also a donor and his wishes will be honored as he can share the gifts of sight, bone repairs, skin and tendons. This could make as many as 75 to 100 lives better and that is what he wanted. 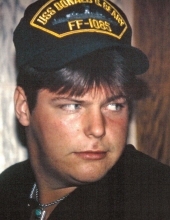 Rob was born 7/20/1966 in Antigo WI to his loving parents, Mary Lynne (DuBrucq) and William P Hull and became a loving younger brother to his only sibling, Wendy Lynne Hull. She had nicknamed him Boomer. He graduated from Antigo Sr High School where he spent years in the scouts and sports. Throughout those years we spent many nights camping at Jack Lake where everyone in the campground got to know and love him. As a family, we also spent a few years downhill skiing in which he and his dad were having the time of their lives on the trails marked in Black. He never missed an opportunity for an adventure! He joined the US Navy and served 4 years on the USS Donald B Beary Frigate Ship and did tours in the Mediterranean Sea and along the US East Coast. Rob was married for a few years in which he had 2 children, Rachel Lynn Hull, 24 and Cody James Hull, 21 who also survive him. He spent many years driving truck for various companies and his fondest memories were being able to take his children with him, even if it meant getting them out of school. On November 2nd, 2012, Rob survived a quadruple bypass, but due to complications of his diabetes and heart, he became totally disabled, but got to spend the past 6 years with his children, family, friends, and riding his motorcycle during the summer months. Rob also found out in the summer of 2018 that he was going to be a grandpa in March 2019, in which he was looking forward to taking care of while his daughter worked. Preceding him in death, were his grandparents, Evelyn and Edgar Hull, step-granddad, Edward R Barnes, and his maternal grandparents, Robert L DuBrucq and Jane DuBrucq. He is survived by his mother and father, Mary Lynne Hull and William P Hull, his sister, Wendy Lynne Hull, and his children, Rachel Lynn Hull and Cody James Hull. Also surviving cousins, aunts, uncles, and many close friends. A celebration of life will be held from 1pm-4pm on February 24th, 2019 at the Eagles Club (1703 S 3rd Avenue) in Wausau WI. The family asks that you please do not send flowers, due to a change in Rob’s life insurance, money donations would be more appreciated. The Mid-Wisconsin Cremation Society is assisting the family. For online condolences, please visit www.HonorOne.com. To send flowers or a remembrance gift to the family of Robert Hull, please visit our Tribute Store. "Email Address" would like to share the life celebration of Robert Hull. Click on the "link" to go to share a favorite memory or leave a condolence message for the family.